●helmets, dry bags and other equipment in addition to your paddle. ❶Hold one single kayak each set. ❷Excellent carrying capacity up to 100 lbs each set. ❸Wall hanger keeps kayak and gear secure and organized. ❹Additional hook can store your paddles and other accessories. ❺Can be folded up against the wall conveniently when not in use. ❻Heavy-duty powder-coated steel construction, rugged and firm, anti-rust and corrosion-free. ❼Strong steel-made cradles with plastic end caps help to hold kayak firmly. ❽Long foam pads protect kayak from scratching. ❾Including mounting hardware, easy installation. ❶Arms fold against wall when not in use and pivot out from wall when ready to use. ❷Paddles and PFD's can be stored on lower hook. ❶WARRANTY: 1 year with 100% satisfaction and zero hassle returns guaranteed. 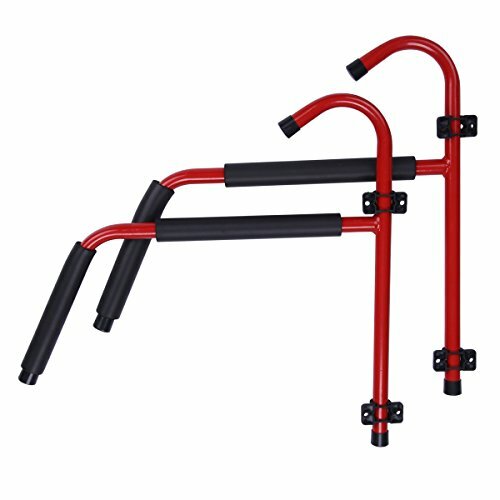 ❷CAPACITY: Excellent carrying capacity up to 100 lbs each set. ❸MATERIAL: Heavy-duty powder-coated steel construction, rugged, firm, anti-rust and corrosion-free. ❹FOLDABLE: Can be folded up against the wall conveniently when not in use. ❺FUNCTION: Wall hanger keeps your kayak and gear secure and organized. Additional hook can store paddles and other accessories. If you have any questions about this product by Excelvan, contact us by completing and submitting the form below. If you are looking for a specif part number, please include it with your message.